The long, national nightmare is over..the Airport franchise is back, baby! Okay, not really. There’s no George Kennedy, or Charlton Heston, and no Love Boat-style parade of guest stars hoping for more face time, but Non-Stop brings the mid-air disaster back to the big screen with plenty of B-movie chutzpah. 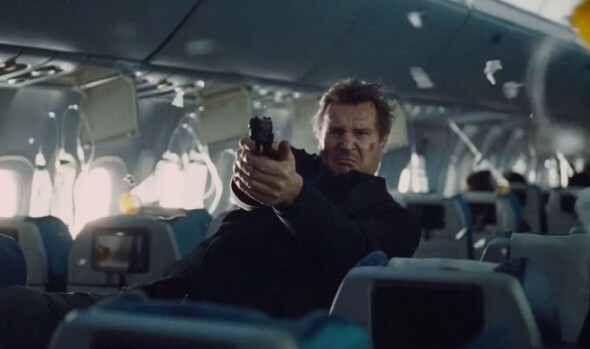 Liam Neeson stars as Air Marshall Bill, a boozy grump with a tragic past who isn’t too happy with his latest assignment on a transatlantic flight. His particular set of skills is tested a few hours after takeoff, when he begins getting text messages from an unseen passenger. Wire 150 million dollars to a secret account, Bill is told, or every twenty minutes, someone on the plane will die. It amounts to an interesting setup from a team of writers, one with a Hitchcock-meets-Agatha Christie vibe that director Jaume Collet-Serra (Unknown, another Neeson thriller) has no trouble fleshing out. Things move fast and deliberately, as suspicions fall on a collection of interesting passengers, including the friendly redhead who insists on sitting next to Bill (Jullanne Moore, classing up the joint). The clearer the resolution becomes, though, the more the film struggles with flimsy contrivance. Yes, it’s a bumpy ride, but Neeson again proves his mettle as a late-blooming action star, and there is just enough fun in Non-Stop to make it an enjoyable, if easily forgettable, trip.